Members of the Anglican Indigenous Network will convene in Hawaii later this month to talk about ways to weave the culture and languages native to Australia, New Zealand, Canada, Alaska, Hawaii and other U.S. states into worship services. Sally Roggia, left, 17-year-old Kaipo Lucas, and Lucas' brother Kapono, 12, blow conch shells prior to the start of the service. St. John's by-the-Sea Episcopal Church, 47-074 Lihikai Drive, Kahaluu. The annual luau will be May 16. Tickets are $20 for the sit-down dinner or takeout meals. Call 239-7198 for reservations. Too bad about their timing. Had they been here Sunday morning, they could have had a Hawaiian immersion experience. From the opening hymn to the closing blessing, and all the songs, psalms, prayers, epistle and Gospel readings in between, the Eucharistic liturgy at St. John's by-the-Sea Episcopal Church was in the Hawaiian language. Even before a word was spoken, three conch shells were blown, instead of the usual bells calling people to worship. The small Kahaluu parish holds a Hawaiian service four times a year. Last week it was in honor of Prince Kuhio Kalanianaole, who was confirmed in the Episcopal Church here, as were Queen Liliuokalani and King Kamehameha IV and Queen Emma, who are honored at other times in the year. The latter two alii, who invited the Anglican Church to Hawaii, are considered saints in the Episcopal Church. St. John's has a Hawaiian legacy all its own. The church was founded in 1931 on the Wailau peninsula -- about a mile makai of the Hygienic Store -- an area that was a fishing village long before Libby McNeil & Libby attempted to grow pineapples there. The congregation first met in a corrugated metal warehouse left when the plantation company pulled out. In 1947 the church members moved into the current white clapboard chapel on Kamehameha Highway at Lihikai Drive. "Fishermen came to this church. The farmers stayed up in the valley at the Methodist church," said Emalia Naipo, 75, who has sung in the choir since she was 17. She is in the 1931 photograph taken at the first service. And, she said, the other 50 or so people in the photo "all were related to me. Seven generations of the Ho'okano family lived here. The family was so close, all the cousins lived nearby. The men earned their living fishing, and some worked on county road crews." She was married to Gene Naipo in 1955 at St. John's, and their five children, since scattered, sometimes return for holiday services. 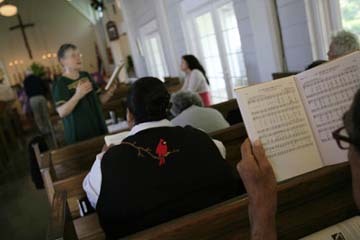 The choir sings church songs in Hawaiian during St. John's by-the-Sea Episcopal Church's Hawaiian Mass, in Kahaluu. The Mass was recited almost entirely in Hawaiian. One of her vivid memories is of Dec. 7, 1941. "I was 7 years old. We were getting ready for church a little after 7 a.m. when we saw Japanese airplanes coming over the mountains. We saw bombs falling in the water. The people all gathered at the church." The nearby Navy Air Station -- now Kaneohe Marine Base Hawaii -- called for men to come and help after the attack. "My father, Kamiki Ho'okano, went," said Naipo. "He was driving his car, and it was strafed by Japanese planes. He was killed that morning." But Sunday was not about sad memories. It was a time of joyous sound as congregation members joined the eight-person choir in familiar Hawaiian hymns and anthems that reverberated into the high-peaked ceiling and out the open windows. Despite its roots, the congregation did not get into total Hawaiian-language worship until the late Rev. Charles Hopkins, a native Hawaiian, came as rector from 1986 to 1996. "We carried on his legacy," said Paul Nahoa Lucas, senior warden. "We should not abandon our culture at the doorstep of the church Sundays. The key is more than physical manifestations but to try to incorporate more of a Hawaiian perspective." Lucas said the indigenous initiatives of the church "are getting us to think how we can incorporate our culture into our worship." With the aid of printed primer sheets, the language tripped off the tongues of the 50 people present in differing degrees of fluency. Lucas' son Kaipo, a Kamehameha Schools senior who was in Hawaiian immersion classes since preschool, said participating in the Hawaiian liturgy "is the best scenario possible for me." He created a cloth banner displayed near the altar, containing images of a Hawaiian hawk, a humpback whale, kukui and taro leaves around a shield and cross. "Each one symbolizes a kinolau, a physical manifestation of a Hawaiian god. It acknowledges our culture and holds Jesus Christ as the center." Kaipo's grandmother Ruth Lucas, his parents and younger brother Kapono are active in the congregation. "In any indigenous people, language is the life force," said Ted Paaoao, who clearly relished the opportunity to add his harmonizing to the choir's efforts. He attended with his wife, Carol, son Pomaikai, daughter Kristin, their spouses and two grandchildren. He said his four children attended Hawaiian-language immersion schools, and the grandchildren will follow. The only English spoken Sunday was the homily by the Rev. Jodene Hawkins, rector of St. Elizabeth's Episcopal Church in Palama, standing in for the Rev. David Gierlach, St. John's part-time rector, who was out of town. "We haven't raised up Hawaiian priests," said Mahi Beimes, one of the lay leaders at the service and a descendant of the Kalahiki family. There is only one native Hawaiian priest still serving in the Hawaii diocese, she said. Already well into her first career as a Pearl Harbor Naval Shipyard manager, Beimes is one of four people in the parish undergoing a discernment process about becoming a priest. "For those of us who are native Hawaiian, it is a concern," she said. "The story of our church in Hawaii began with the invitation of the king and queen." It's not their language, but Frank and Caitilin Embree read along and said they enjoy the church's multiethnic culture. Both have lived in other countries and experienced worship in other tongues. "What I like is that three and four generations of involvement are going on," she said. 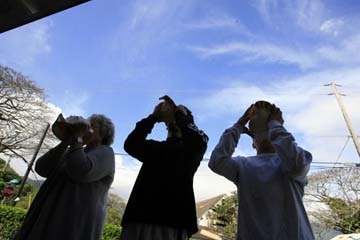 Mary Adamski wrote weekly about Hawai`i's houses of worship in the former Star-Bulletin.